I recently visited Portland, Maine for the first time on my way to take-in some trails further northeast. I really enjoyed the restaurants in and around South Portland in particular. I have always heard great things about the city (and they’re all true,) but I couldn’t help but compare it to Lancaster, Pennsylvania. After much thought, Portland felt bigger than Lancaster, making Lancaster the ideal size for me. When I looked up the population, Portland had just 10,000 more people; I guess that’s my tipping point. When I do need a “big city” (which I actually don’t,) I go back and visit friends in the Washington, DC area where I moved from. In fact, I’m hoping one of my climbing writing friends who has a Banff Mountain Book Competition book on the 2018 shortlist will be visiting those of you in DC very soon to do a book reading and signing. I recommended the usual event spaces for things like that, like Patagonia Georgetown, the new (is it still “new”?) REI flagship store, or one of the climbing gyms; I urged him to go to my favorite, Sportrock Alexandria. We’ll see and I’ll update everyone on Facebook and Twitter. Well, I thought as I haven’t posted in a little while that I would start by updating you on what’s on my list. No award nominees right now. I hope to have a few new book reviews for you this fall, including a book that was just released from Rocky Mountain Books. I’ll let you know when I have that. 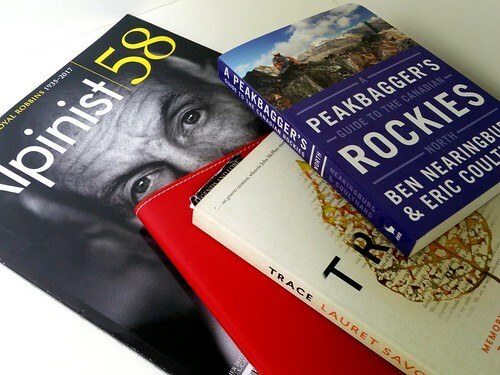 Alpinist 63 — Always stop, drop everything else, and read Alpinist. In this issue, Pete Tekeda completes the lengthy Mountain Profile on Nanda Devi. And I must admit to be being a sucker for stories about the supposed edge or future of alpinism, and I think Jumbo Yokoyama’s article on K7 West fits the bill. I am also really excited to see so many bylines in 63 that I haven’t read before. The Glorious Mountains of Vancouver’s North Shore: A Peakbagger’s Guide by David Crerar, Harry Crerar, and Bill Maurer, published by Rocky Mountain Books (2018) — I love the Coast Range and I liked Vancouver very much when Natalie and I visited in 2008, just when their Winter Olympics were building up. This guidebook is bright, beautiful, and sets expectations for every reader by providing the traditional narrative (thought the print is a bit small) and a fantastic bullet summary made for bona fide peak baggers. It makes it simple to consider and compare to other mountains: The guide gives warnings, rates things out of five like “bang for buck” and “peak view,” and — I love this — says where there is and is not reliable cell coverage. Of course trails and mountaintops that overlook the sea are pretty compelling by themselves. Go get a copy and buy a plane ticket! Blisters and Bliss: A Trekkers Guide to the West Coast Trail by David Foster and Wayne Aitken, Illustrated by Nelson Dewey 6th edition, published by B&B Publishing (2010) — The first edition was out in 1989 and it has quite the following, even if you haven’t or don’t plan to hike this short trail. The West Coast Trail is a relatively short, but complicated obstacle course, with a variation along the “beach” and the woods in some portions. Unlike other hiking trails, you need a tide chart and a watch to safely navigate this trail. The guidebook is sometimes tongue-in-cheek with comments and illustrations that never take itself too seriously. I just finished and highly recommend it. 2018 American Alpine Journal, 2018 Accidents in North American Climbing, and the American Alpine Club’s 2018 Guidebook to Membership — Members of the American Alpine Club receive this all around the beginning-to-mid-August. the 2018 Guidebook to Membership is the sixth they’ve published and is part magazine, part program directory, and part annual report and is surprisingly anything but dull. I’ll be digging into the new AAJ and ANAC in the next few weeks. Climbing matters even though we work nine to five. I’m about to finish Alpinist 43 and will move onto dissecting the 2013 American Alpine Journal. Perhaps “dissecting” is too strong of a word, but I think you get the idea. I appreciate you stopping by for a read once again. If you enjoy these posts, please consider following the Suburban Mountaineer on Facebook and Twitter.